The light should turn on automatically when it gets dark outside and someone is in the room? 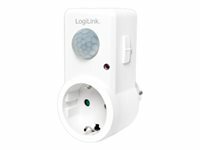 LogiLink's socket adapter with dusk sensor and motion detector is the right choice! Simply plug the adapter into the socket and the plug of the lamp into the adapter. The socket will only turn on, when a low ambient light and motions in the room are detected. The light sensitivity, motion speed and activation time can be adjusted individually.